If Charles Dickens had not become a writer, he would have been an actor: He loved the theatre and he loved performing. He appears to have been one of those novelists whose characters speak to them as voices in their head, and he certainly became famous for reproducing those voices in his popular public readings. Combine that literary relationship with the idea of ghostly apparitions from A Christmas Carol and it's not hard to conceive of living, breathing versions of Scrooge, Bob Cratchit and Tiny Tim invading Dickens's life in rather the same way the Christmas ghosts appeared to the miser in what remains the author's best-loved story. 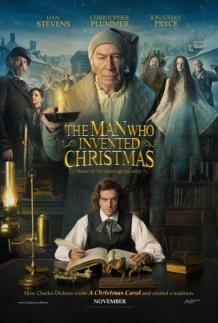 That is the delightful parallel conceit behind The Man Who Invented Christmas, a whimsical film adaptation of a 2008 book of the same title, which credited A Christmas Carol with codifying our December traditions and establishing the holiday's association with friendship, goodwill and charity. A lively Dan Stevens plays Dickens as a driven but largely sympathetic character with only light hints of the harder side of the author's large personality: He is a charismatic and highly imaginative man but also self-absorbed, impulsive and occasionally uncharitable. In 1843, after a series of flops, he is particularly unsettled, shadowed by his impecunious father, his growing family – Morfydd Clark's pleasantly long-suffering Catherine has a fifth baby on the way – and his deepening debts. To pay them, he conceives of writing a quickie Christmas book, and trips about London trying to figure how to get it published in a mere six weeks with the help of his ever-genial friend and adviser John Forster. (In that role, Justin Edwards anchors the sometimes frenetic action, nicely countering Stevens's fizz with his own solidity.) But if the book is to be published, Dickens must also write it, so at night he takes to his study to consult his many muses. Chief among them is Christopher Plummer's wickedly obstructionist Ebenezer Scrooge, gleefully confronting Dickens with his own failure to get the writing done. Adapting the book by the American writer Les Standiford, Toronto actor and screenwriter Susan Coyne gradually establishes not merely a literary parallel but also a biographical one: Drawing from Dickens's biographers, the film suggests that the writer himself had his Scrooge-like side. As he conjures his famous character, Dickens must also confront both the ghosts of the infamous blacking factory where he was forced to work as a child and his own bitter estrangement from the father (a spritely Jonathan Pryce) whose indebtedness placed him there. You don't need to have read A Christmas Carol to follow the plot, but certainly the special delight of The Man Who Invented Christmas is playing spot-the-character, as Dickens's wizened lawyer and his many lockboxes give rise to Marley's chained ghost or an inquisitive young housemaid (Donna Marie Sludds) and Forster himself are suddenly reincarnated as Christmas past and present. Director Bharat Nalluri sets a pace as punishing as the title character's – the film is mainly a quick romp – even if he does indulge in some unnecessarily Dickensian melodrama along the way: In one flashback, the Black Maria that carts Dickens Senior off to debtor's prison literally deposits little Charles at the gates of the blacking factory. Meanwhile, Standiford's larger thesis that A Christmas Carol actually launched today's cheerful secular celebration does force Coyne into the occasional piece of clunky exposition: A publisher dismisses Christmas as a minor holiday; a prescient Dickens predicts that the Christmas tree will become popular since the Royal Family has adopted the practice. Still, it would be miserly to make much of these flaws. Mainly, the fancy at the centre of The Man Who Invented Christmas provides an unusually kinetic literary biography as the writer races against the clock to master the voices of his obstreperous characters in time for the 25th.